This chapter lists and describes many of Mathcad’s built-in statistical functions. 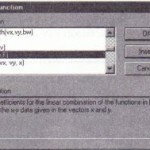 These functions perform a wide variety of computational tasks, including statistical analysis, interpolation, regression, and smoothing. 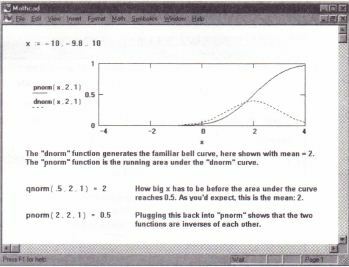 Functions for computing the mean, variance, standard deviation, and correlation of data. 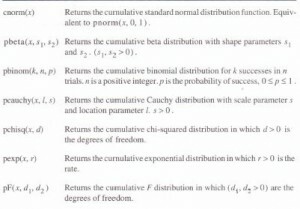 Functions for evaluating probability densities, cumulative probability distributions and their inverses for over a dozen common distribution functions. now to count the number of data values falling into specified intervals. 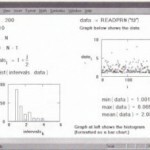 Generating random numbers having various distributions. 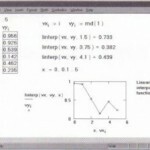 Linear and cubic spline interpolation. Functions for multivariate interpolation. 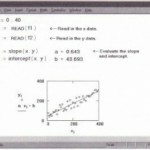 Functions for linear regression, polynomial regression, and regression using combinations of arbitrary functions. Functions for smoothing time series with either a running median, a Gaussian kernel, or an adaptive linear least-squares method. 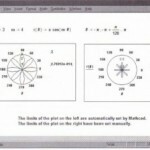 Mathcad includes eight functions for population and sample statistics. In the following descriptions, m and n represent the number of rows and columns in the pecified arrays. 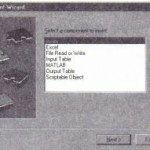 In the formulas below, the built-in variable ORIGIN is set to its default value of zero. Probability densities: These give the likelihood that a random variable will take on a particular value. 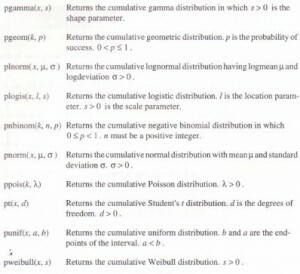 Cumulative probability distributions: These give the probability that a random variable will take on a value less than or equal to a specified value. These are obtained by simply integrating (or summing when appropriate) the corresponding probability density over an appropriate range. 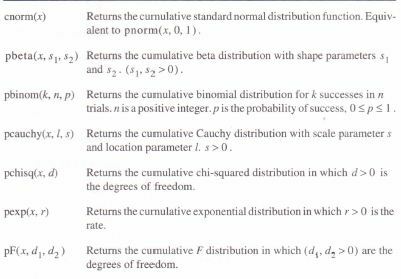 Inverse cumulative probability distributions: These functions take a probability as an argument and return a value such that the probability that a random variable will be less than or equal to that value is whatever probability you supplied as an argument. 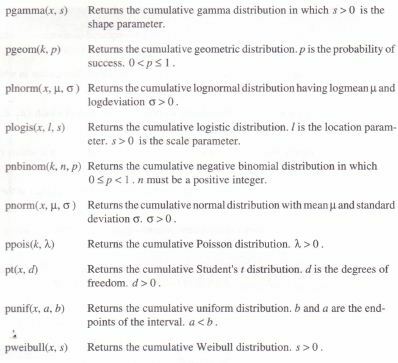 These functions return the likelihood that a random variable will take on a particular value. The probability density functions are the derivatives of the corresponding cumulative distribution functions discussed in the next section. These functions return the probability that a random variable is less than or equal to a specified value. The cumulative probability distribution is simply the probability density function integrated from -00 to the specified value. For integer random variables, the integral is replaced by a summation over the appropriate range. The probability density functions corresponding to each of the following cumulative distributions are given in the section “Probability distributions” on page 281. 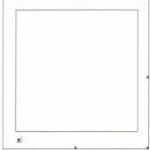 Figure 14-1 at the end of this section illustrates the relationship between these three .A functions. These functions take a probability p as an argument and return the value of x such that P(X::;x) = p.
The probability density functions corresponding to each of the following inverse cumulative distributions are given in the section “Probability distributions;’ on page 281. Relationship between probability densities, cumulative distributions and their inverses .